I had a couple of concerns with the recipe because of the venacular for some of the instructions. It called for the bread to be baked in a Pullman Pan, but obviously from the measures, this dough wouldn't make enough to fill a pullman pan. So, I called a friend of mine who is Chinese and asked her if the term "pullman" could mean a standard bread loaf pan and she guessed it did. I followed her advice and it turned out to be just right. The other issue I had was this dough seemed a bit dry as it was coming together in the mixture. I had to add a bit more water and then all of a sudden, it became way too wet, with just a couple of tablespoons of water.. so I added more flour. I thought I really messed it up, but it actually turned out perfectly. The dough I was working with was quite sticky.. so you decide. It is not intended to be a high hydration dough, but the dough was so dry at first that it refused to come together. When it did, however, it was beautiful and silky to work with. Here is the formula. Would love your feedback on this. It was truly easy to make, with the exception of a few minor tweaks. It was a very fun loaf to put together and the taste and texture are outstanding. We had pot roast last night and it was the perfect accompaniment with the beef gravy. The rising did take alot longer than I'm used to and the dough is a tad sweet like a dinner roll. Even though there is 1 tsp of yeast in this small batch, each rise took at least 70 minutes. The second rise took a full 1.5 hours, but it was well worth the wait. Next time I think I will double and make dinner rolls or even cinnamon rolls. In a small saucepan add egg yolk, flour, sugar and milk. Using a wire whisk, stir together all ingredients over medium low heat. Keep whisking until a paste forms and becomes stiff enough that it no longer drips off the whisk. Transfer the custard using a spatula to a small bowl and let cool slightly. Cover with plastic wrap and store in refrigerator for one hour. 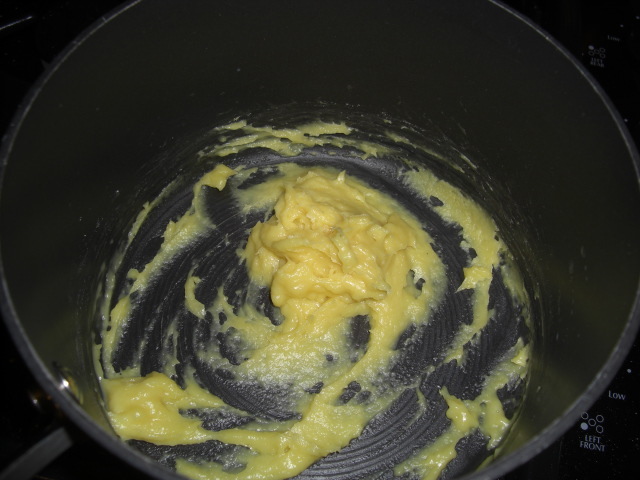 In a mixing bowl with a dough hook attachment, mix the custard and all dough ingredients except for the butter. Knead well, keeping an eye on hydration. Dough should be quite sticky, but pull clean from the sides of the bowl. 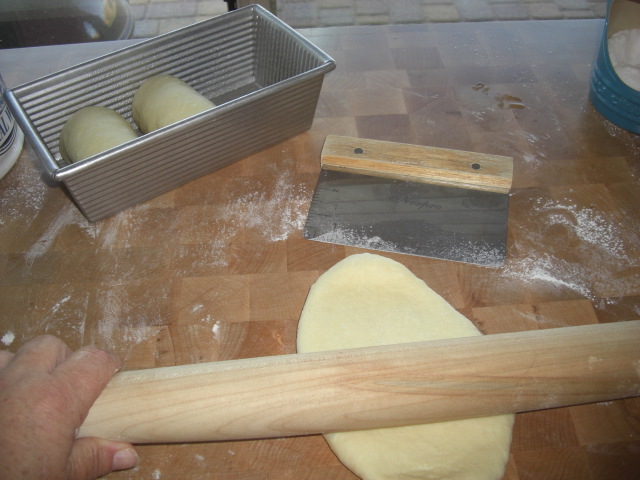 When window pane test has been achieved, mix in the softened butter using the dough hook. Mix butter thoroughly. Transfer dough to a greased bowl and allow to rise for at least 60 minutes. Mine took about 70 minutes on the first rise. When dough has risen, gently fold dough to remove air bubbles. 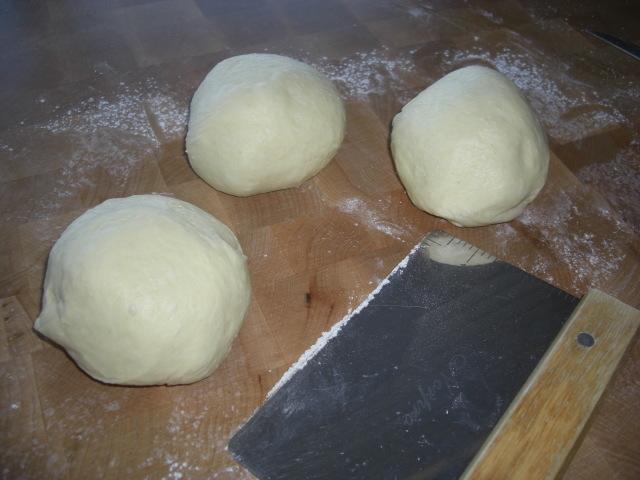 Divide dough into three balls, dusting lightly with flour. Cover with plastic wrap and let rest for 10 minutes. 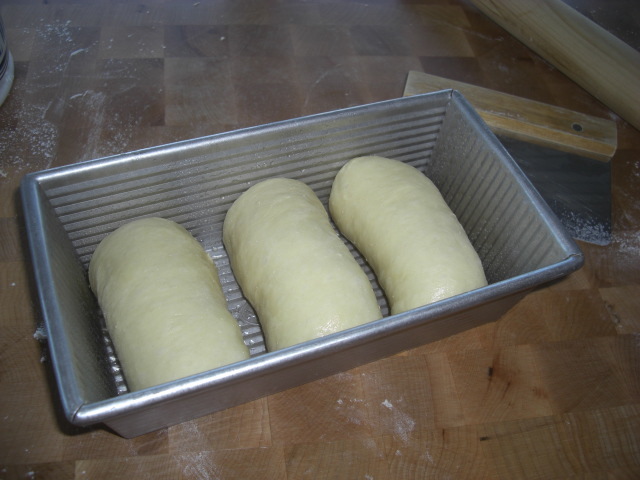 Prepare a standard bread pan by lightly greasing and setting it aside. Using a rolling pin or your fingers, flatten out the first ball to an oval shape.. about 6-8 inches long. Roll up jelly roll style and pinch ends and seam together. Place first roll seam side down in pan on one end. 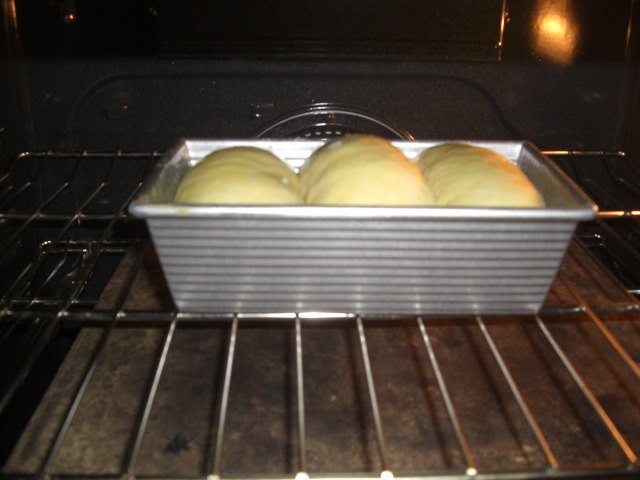 Repeat with the second and third dough balls, placing each roll into the pan, spaced fairly evenly apart. Let rise, covered with a tea towel, in a warm place for at least 60 minutes. Mine took 1.5 hours, but dough should fill 90% of the pan. Set oven to 375 and if desired, brush with an egg wash before baking. Total baking time is 30 minutes. Check loaf after the first 20 minutes.. If it is browning too quickly, cover loosely with aluminum foil. Bake for 10 more minutes. Above is the custard. Using a wire whisk makes it easy, cook over medium low heat - more low than medium. After a few minutes, it just seizes up like this. Shaped dough... as you can see, very small! Just out of the oven. A really cute little loaf! And yes, it was THAT SOFT and squishy! Let me know how it works out. It really was seriously good bread! I'll be anxious to hear how you liked it. I'm glad you had a good loaf! So happy you had success with it. I didn't worry about cooking the custard as that's what custard is.. cooked. Not sure how it would affect flavor or the bread itself, probably not much, but with the low heat, it didn't cook the egg in a negative way. At first my dough was very dry.. I added a few tablespoons of water and it instantly became far too wet, so I added more flour.. LOL. It never got stiff, but extremely tacky and silky after adding in the butter. Next time, I'll hold out some of my flour and add it more gradually at the end. I just mixed it all up in my kitchenaid. I'm going to try this again, only doubling it and using the dough for cinnamon rolls. 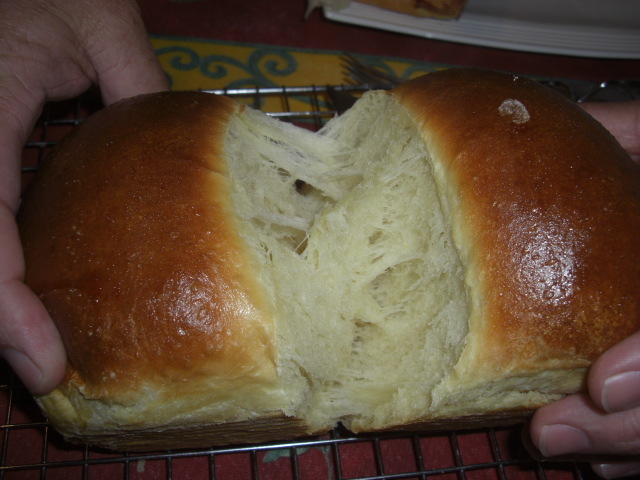 It's really a great dinner roll dough to be sure.. and a bit on the sweet side, so one could easily cut back on some of the sugar. I have made bread using the water roux method which is similar to the recipe you posted but the I've added the eggs to the dough rather than the roux. Interesting twist. I am always amazed at how many variations there are on simple ingredients and the delicious products produced. The water roux bread does have a very sticky texture but makes an incredibly soft loaf. I have used the technique in making a very soft whole wheat bread.The roux, combined with a 30 min soak of the whole wheat flour really added up to a soft loaf. I don't have a recipe developed-just tried it once or twice adapting my daily bread sourdough whole wheat recipe. I don't know if it was the above link but somewhere it was said that to adapt a recipe to using a water roux, use 5% of the flour (in grams)as the maximum amount in the roux and 5x the amount of that flour as the liquid. Subtract these from the usual recipe amounts of flour and liquid. I was working with a sourdough starter on top of that so I dopn't know if that adaptation will really work. Very similar recipe, but the way they cooked and treated the custard/roux is very different, so I wonder how they would look, side by side. I see she/he used a pullman pan, wonder what size was used for that? In the above recipe, they don't require the custard to be at room temperature and I didn't find it made a big difference when mixing the dough. I was surprised to achieve a proper dough that started out cooler. I also wonder, if the egg structure doesn't change.. from raw to cooked. Interesting to say the least. I'll have to try this to see if it's different. I am so excited about this recipe. I read it and re-read it yesterday and so want to make it. Has anyone ever doubled it. Seems like the perfect bread for my big pullman....I think this will be my bread today.....Thanks for the recipe. Hi Ruthie.. glad you're making the bread. I've never doubled it, but then again, there is just me and my husband, so one loaf is just perfect for us. You will be surprised how little dough there is - but if you doubled it, it might work for a pullman. I can't guarantee how it will come out if you put the lid on it, though. I'm curious to your results and can't wait to hear. I love the pretty domes and the color of the top. A single recipe fills a regular bread pan 8.5 x 4.. so a doubled amount could be just right in a pullman. Let me know how it goes for you! I'm excited that you're excited! I have most of her recipe books (Meng Lao Shi). 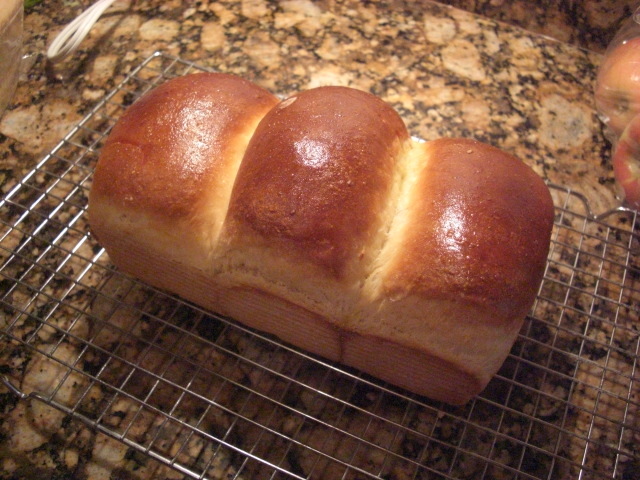 I have that 100 bread recipes book and did most of the bread and they came out beautiful and very soft and nice. i highly recommend u to buy her book. Recently i did this recipe by her and it is so nice. u can give this a try. Knead everything (except butter) until it forms a dough. Knead in the butter until it passes window test. Mix in the 60g chopped walnut. Shape the dough and put in a loaf tin. Loaf proof for 50mins in a warm/humid enclosed environment. U can put it in the oven with a tray of hot water at the bottom. The hot water will create the heat and humidity suitable for proofing. Change the water once it has turned warm to touch. Bake at 190 degree celsius for 30mins.